One afternoon last month at a farmhouse west of Stoughton, a man knocked on the door, announced he was from the state of Wisconsin and said he wanted to talk about burial grounds. The house's owner, C.R. "Skip" Johnson, didn't have the faintest idea what the man was talking about, but he invited him in anyway. Johnson, 80, is a retired UW-Madison professor of art, a nationally known wood artist and craftsman, and a character much-loved by his many friends and admirers. 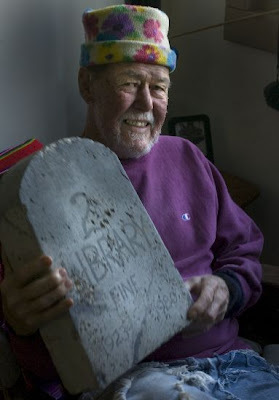 One of them, David Peterson, himself a retired UW-Extension professor of music and theater, was at the house last month when the burial ground guy came by. That afternoon, the man explained that he was a consulting archeologist with the state of Wisconsin. The state was considering some road work on Highway 138, and their paperwork showed there had once been a burial ground on the property near the highway. It might impact construction plans." I was looking at Dave and we were both wondering what the hell he was talking about," Johnson was recalling recently. A burial ground? If anything, Johnson was feeling fortunate to be on this side of the ground himself. Two and a half years ago, he was diagnosed with a brain tumor about "the size of a lemon," as he puts it. He had surgery to remove it, and his subsequent recovery has been remarkable. "I've confounded the doctors," he said. They confounded him, too, by suggesting he might not want to drink beer any longer. The other day he was having an O'Doul's, not altogether happily. Johnson has to watch himself -- "I slide sideways sometimes," he said -- but he hasn't lost his irreverence. Grabbing a cane as he stood up, he said, "This is the cane I use to go find my other cane." Johnson's puckish sense of humor is sometimes reflected in his work. He once created several pig silhouettes that when displayed were good enough to convince at least one neighbor that Skip was raising pigs. And so it was that during the burial ground discussion in December, something clicked for Peterson. "Hey, Skip, wait a minute," he said. "You know what he's talking about." 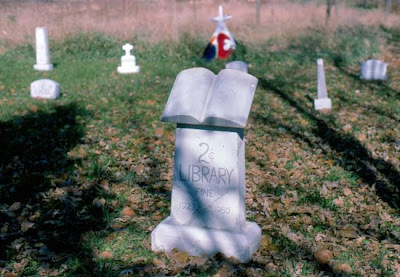 Johnson had always enjoyed visiting small cemeteries around Dane County. He liked reading the inscriptions on the tombstones.He's not alone in that. There's even a book, by Nigel Rees, titled, "I Told You I Was Sick: A Grave Book of Curious Epitaphs," devoted to the topic. The epitaph in the book's title is from a stone in the Key West cemetery. There are reports -- unconfirmed -- that somewhere in Dane County there is a grave stone with the epitaph, "She finally sleeps alone." After one such cemetery outing 25 years ago -- in the summer of 1983 -- the artist decided to create his own. "I made the stones out of insulating foam," he explained recently. Johnson decided to "bury" various things that were, as he said, "gone or no longer wanted." Johnson's cemetery -- presided over by a fearsome-looking vulture -- included stones for 10-cent beer; 5-cent coffee; 2-cent library fines; Nehru jackets; Johnson's own neckties; and several more. From the highway, it probably looked like a real cemetery, and it somehow found its way onto some state of Wisconsin paperwork. The confusion a quarter of a century later should only add to Skip Johnson's considerable legend. To take a tour of his house, and his studio that's nearby on the property, is to witness an astonishing display of woodworking art. A favorite piece is a broken North Carolina ore car that Johnson re-configured with the wheels on top and the "ore" spilling out onto the floor. The piece is also a working liquor cabinet. "He was one of the pioneers of the concept of wood in the arts," Peterson said. Originally from New York state, Johnson joined the UW faculty in 1965. He has a devoted cadre of former students, and not only because he occasionally held seminars at Genna's, the University Avenue bar Johnson preferred over the more traditionally popular 602 Club. On that afternoon last month, the state archeologist decided that foam tombstones probably wouldn't interfere with any upcoming road improvements. It's just as well Skip Johnson didn't tell him about the vulture. I just heard of Skip's passing on 09/09/09. Thanks Skip, your playful spirit, great sense of humor, amazing feats in woodworking, great teaching ability, love of beer, fun times and old time jazz had a huge impact on me and will always inspire me. We will all miss you.